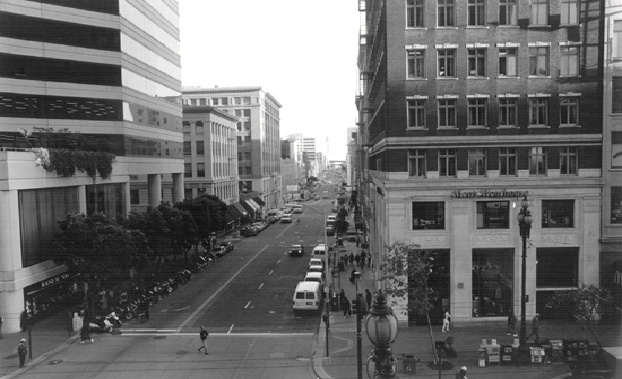 2nd Street from Market, looking south, 1994. "For twelve years we've had the levelling of hills...The city was laid out by those who believe there is no beauty in anything topographical but dead level, and streets running at right angles...a wiser community would have tried to make their streets suit the topography of the site." Despite these sentiments and in the name of progress, the hill flatteners continued to have their way. 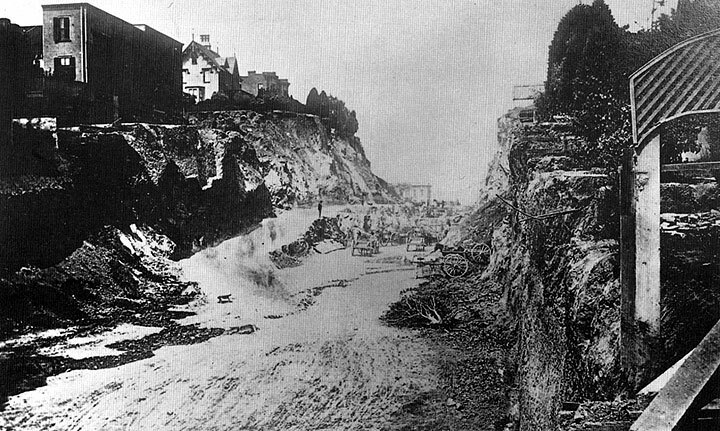 The Second Street Cut through Rincon Hill was made in 1869. Behind the plans for a cut was the wealthy land owner, John Middleton. He felt that a flat passage to the Pacific Mail Wharves at the southern end of Second Street would increase that street's commercial appeal and the value of his own lot at Second and Bryant (now 501 Second, an office building). Through a series of political and business connections and also due to his affiliation with many of the City's social clubs, Middleton got himself elected to the State Assembly and quickly introduced AB 444, authorizing San Francisco's Board of Supervisors to modify and change the grades of streets as they saw fit. A public hearing was held and arguments were made to the Board. The Anti-Cut Contingent argued that Rincon Hill was the favorite place of residence of men of wealth and that many of San Francisco's most elegant dwellings (were) there. 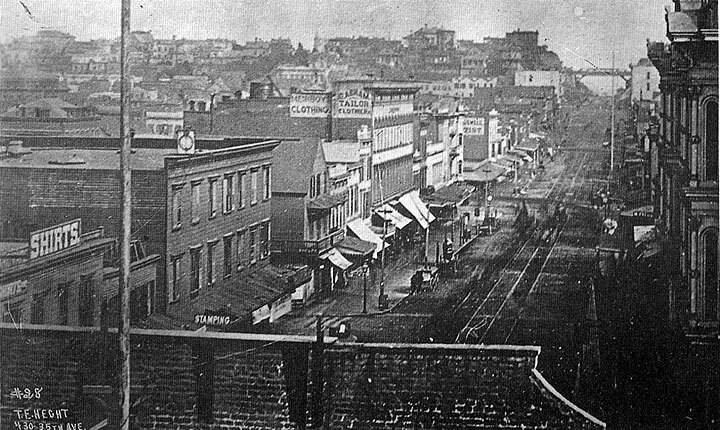 Those who favored the cut claimed that the highly anticipated San Francisco terminus of the Transcontinental Railroad could be situated at the newly filled-in Mission Cove and serviced by the soon-to-be flattened Second Street corridor. To the objections of the influential property owners who would be most directly affected by the cut, the Pro-Cut faction argued that a few wealthy people should not stop the march of improvement. The interests of the community were more important. 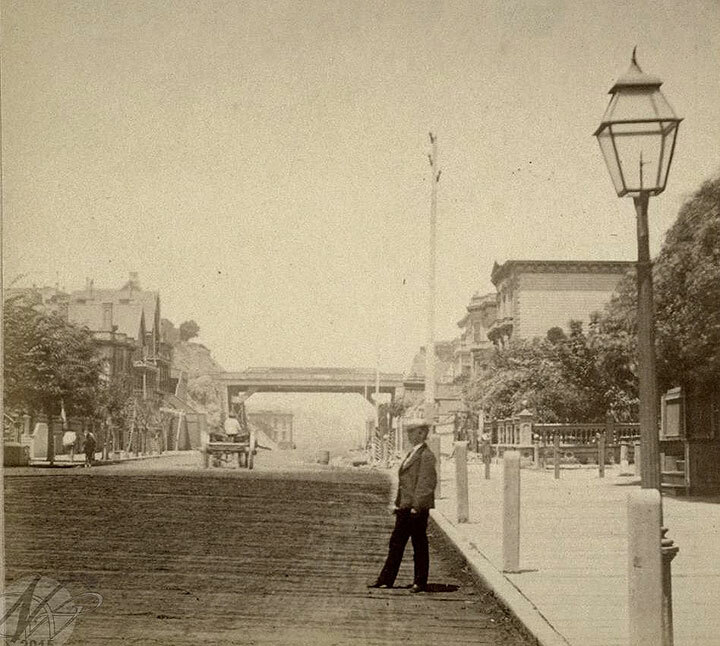 In April, 1868 The San Francisco Newsletter claimed: "...the destiny of San Francisco is clear...your children will bless you if the waterfront is filled in from Mission Creek to the county line." View of 2nd Street after the "cut." When the Board voted, six were in favor, two were opposed and two abstained. Although they were one vote short of approving the cut, the California Supreme Court voted unanimously in February 1869 that The City must cut through the hill and use the rubble to fill in the swamp lots of South Beach. The peak of the hill, at Harrison, was lowered by 87 feet, a wooden bridge was built on Harrison across the chasm and stairs were constructed from lowered Second Street up to Harrison. The job was far more arduous and expensive than had been anticipated. Employing 500 men and 250 teams of horses, the job took just over one year and was at least $100,000 over budget. The Harrison Bridge, called unsightly and atrocious by the local press, cost $90,000 alone. Property values around the cut plummeted. 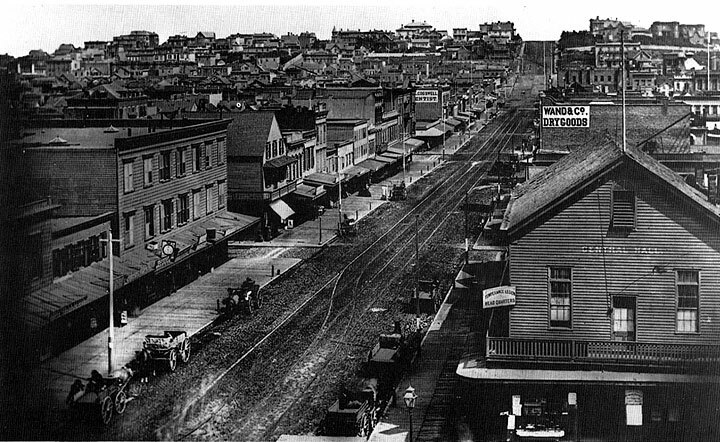 The noise and dirt which accompanied the cut combined with the impending approval of Cable Car Franchises up the California Street Hill led many of the Rincon Hill notables to relocate to what was becoming Nob Hill. William Ralston, the founder of Bank of California and one of San Francisco's most colorful and wealthy residents, had the idea to remove yet more of Rincon Hill and to extend Montgomery Street South (now New Montgomery) to the waterfront. Ralston showed his faith in the project by building the colossal Palace Hotel at the corner of Market and Montgomery South. Due to two particular merchants' unwillingness to sell to Ralston, Montgomery Street South never got beyond Howard Street.